Lore fits on the larger side on my the face. I consider myself as having a normal sized face. The frame is thicker plastic called Grilamid TR-90. The frame we tested was Crystal clear witch makes the eye wear "cool looking" . I never became a friend with Lore. Sure this is a cool looking product but the fit is not there. Several of times I thought I got the fit right by adjusting the nose tip, but the Lore Sunglasses keeps bouncing around. Specially during faster work outs and on hill work outs. 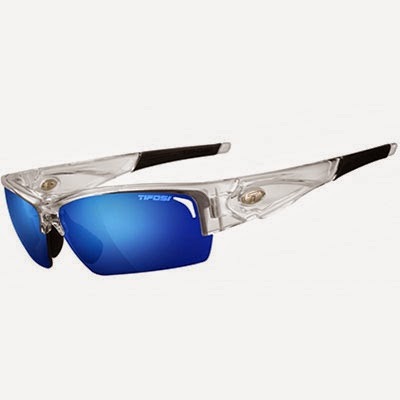 Tifosi offer a great lens that offers a comfortable blockage again the sun. The lens is wide and block the sun from all angles. Lenses are polarized and comes with a scratch protection. Lens has not fogged up during runs winter and spring conditions. The lens has a venting system that works as a great feature. The lens has a coating that repels water and sweat. Interchangeable Lenses: Yes, comes with 3 interchangeable pairs of lenses. Slower long runs and for runners with a wider face to secure the fit. Lore is a good looking product and I wish the fit would have been there, but the bouncing around and non secure fit made the Lore not a great product for me. Lore also feels a bit heavy compared to other product in this review. Tifosi offers a wide variety of Eye wear that we feel are a better match for runners.